At least 650 members of the National Association of Black Journalists accepted an invitation from Prince to pay $20 apiece to visit the Paisley Park studio complex used by the entertainer outside Minneapolis Saturday night in hopes of seeing the star himself. But the NABJ members — and an additional 227 people who paid $50 for the privilege — saw an appearance of just two minutes or so in which the entertainer plugged his upcoming recording. He did not perform. Attendees spent an additional 110 minutes moving their bodies to dance tunes from the '70s and '80s transmitted with heavily enhanced bass beats inside a dimly lit airplane hanger-style hall that featured hefty speakers and a screen with kaleidoscopic images. Some partygoers were fine with what took place; others were not. While the everyday NABJ members were speculating on whether the star would show, 10 of them received 45 minutes of interaction with the entertainer. In that meeting, Prince urged news coverage of what he called exploitation of young artists by the music business, which he said requires artists to relinquish too much to the industry, according to Bob Butler, the NABJ president who was among the attendees. "He wants us to really write about what's going on in the music industry," Butler told Journal-isms. The rock star urged young artists not to sign contracts with the companies. Also in the meeting with Prince were Kelley L. Carter of BuzzFeed; Bryan Monroe, a past NABJ president; Eric Deggans, NPR television critic; Errin Whack, NABJ's vice president-print; incoming NABJ president Sarah J. Glover; ESPN host Michael Wilbon; Barbara Ciara, a past NABJ president; Trymaine Lee, a writer for MSNBC; and Carol Ash of WMAQ-TV in Chicago. "Prince has had a love/hate relationship with the Internet since the Napster days," Oscar Raymundo reported June 30 for Macworld. Last year, Prince quit Facebook, Twitter and YouTube, and in July, his catalog was removed from iTunes and Spotify. The albums, including classics such as "Sign O The Times" and "Purple Rain," have found a home on a new venue assembled by Jay Z, Alvin Aqua Blanco reported Thursday for HipHopWired.com. Prince announced Thursday that the Tidal streaming service, assembled by Jay Z and including shareholder-artists Beyoncé, Madonna, Rihanna, Nicki Minaj and Jack White, would be the exclusive home of his upcoming record HITNRUN, to be released Sept. 7. "After one meeting, it was obvious that Jay Z and the team he has assembled at TIDAL recognize and applaud the effort that real musicians put in2 their craft 2 achieve the very best they can at this pivotal time in the music industry," Prince said in a statement. "TIDAL have honored Us with a non-restrictive arrangement that once again allows Us to continue making art in the fashion. We've grown accustomed 2 and We're Extremely grateful 4 their generous support." It was that message that Prince used his two minutes to tell the Saturday night Paisley Park audience. "Jay Z and I have an album coming out on Jay Z's title. Downloads are coming. He needs our help," the entertainer said. And then he was gone. The dance music returned. Were audience members expecting too much? Butler messaged NABJ members on Friday, "I received a text on Wednesday that NABJ was invited to hold a dance party at Prince's Paisley Park. When I asked if Prince was going to be there I was told, 'I think so.' Cover charge is $20 at the door. 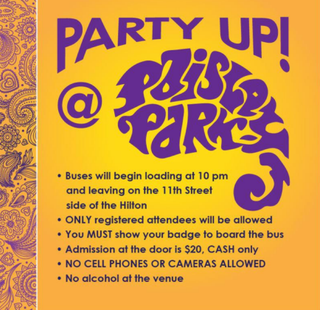 Buses will take registered convention attendees from the Hilton to Paisley Park following the Salute to Excellence Gala." No cell phones were allowed. Attendees were urged to leave them behind. NABJ, which had already announced it faces a potential deficit, paid about $10,000 for buses to take members to Paisley Park in suburban Chanhassen, NABJ Executive Director Darryl R. Matthews told Journal-isms. Waiting for the return trip to Minneapolis, where the association is concluding its 40th anniversary convention, Derrick Clifton, deputy opinion editor of dailydot.com who is based in New York, said of the evening, "I thought it was great. It's not every day you get to go to Paisley Park. It's a once-in-a-lifetime opportunity, especially if you're not in Minneapolis." The absence of cell phones "gave us as a community of journalists a chance to talk to each other," he said. With the devices, the journalists would probably be on Facebook, Twitter or Instagram, and trying to capture inside photographs of Paisley Park, Clifton added. However, Margo Spann, a Los Angeles-based journalist, told Journal-isms, "Disgusted is not the word to describe how I feel. With the number of restrictions put on, the event was hyped. What was presented I didn't have to wait two hours [for]. I feel disrespected." The entertainer could have delivered his message on Twitter and saved everyone's time, she said. For those in need of souvenirs, Prince T-shirts were available for $30, vinyl albums for $20, posters for $10 and tote bags for $40. The evening drew 877 people, according to Jason Carlson, Paisley Park's assistant manager. Sarah J. Glover, social media editor for NBC Owned Television Stations who said members of the National Association of Black Journalists related to her professional ups and downs as well as her service, was elected NABJ president on Friday. Glover defeated Mira Lowe, senior features editor of CNN Digital and wife of former NABJ President Herbert Lowe, 347 to 167, as the association held its annual convention at the Minnesota Convention Center in Minneapolis. It is celebrating its 40th anniversary year. In the other contested races, Dorothy Tucker, a reporter for WBBM-TV in Chicago, defeated incumbent Dedrick Russell, reporter for WBTV-TV in Charlotte, N.C., and Galen Gordon, a coordinating producer for ESPN, for vice president-broadcast. The results were Tucker, 230; Russell, 157; and Gordon, 126. Glover, Tucker and several unopposed candidates ran as part of a team. For the new position of media-related representative, Tanzi West Barbour, national director of communications for the Black Alliance for Educational Options, defeated Terry Allen, CEO of 1016 Media in Dallas, and Marc Willis, media program manager at the U.S. Food and Drug Administration. West-Barbour received 40 votes to 32 for Allen and 31 for Willis. Running unopposed were Benét Wilson, owner, founder and editor of Aviation Queen LLC, vice president-digital; Marlon Walker, reporter at the Atlanta Journal-Constitution, vice president-print; Sherlon Christie, sports reporter at the Asbury Park Press in Neptune, N.J., secretary; Greg Morrison, assignment editor for the Affiliate Content Center at CNN, treasurer; Dave Jordan, investigative reporter at WSPA-TV in Spartanburg, S.C., parliamentarian; and Michelle Johnson, associate professor of the practice, Boston University, academic representative. The results were prematurely announced on the NABJ Twitter feed at 6:01 p.m. as reporters, supporters and others awaited the results in an overflowing press room at the convention center. That announcement did not come until 20 minutes later. "We wanted to make the grand announcement here, but somebody put it out on Twitter, so we already know who won," Michael Woolfolk, Elections Committee chair, told the assemblage. Candidates' and NABJ representatives attributed the premature release to a misunderstanding with the NABJ national office about the release time. The new NABJ board takes office facing the prospect of a second consecutive year of red ink and after a falloff in convention registration, a drop in corporate sponsorships and a decline in membership, NABJ leaders told members at their annual business meeting Friday. With 2,851 members as of June, NABJ was called the world's largest organization of journalists of color, but Morrison, named by the board to become interim treasurer on Tuesday, told the board that those numbers alone won't keep the association solvent. "We've got to turn the Titanic around, folks, because we are on the iceberg," he said on Tuesday. NABJ ended 2014 with a $202,000 deficit, NABJ President Bob Butler said at Friday's meeting. If the fiscal year ended today, NABJ would be $227,137 in the red for 2015. As of Tuesday, 1,716 people were registered for the convention, compared with 2,158 last year in Boston, 2,207 in 2013 in Orlando and 2,399 in 2012 in New Orleans. "We've had a tough time raising funds," Morrison said. Corporate sponsorships totaled $943,004 in 2015, compared with $1,052,560 in 2014 and $1,197,558 in 2013. "Some of the companies that we have gone to in the past have now merged," Butler told the NABJ Monitor, the convention's student online and print publication. "Instead of getting two checks, we now get one." Morrison said in his report, "It remains imperative that NABJ continue to hold expenses well below budgeted levels for the remaining five months of 2015, and that we maximize additional revenues from programs planned for the second half of the year." Most in-person board meetings have been scrapped in favor of conference calls, he said. Butler said the organization would place more emphasis on year-round training, so that sponsors' dollars would come from their training, rather than their diversity budgets, and for the next few years would eschew convention centers for its annual gathering in favor of hotels. Next year's joint convention with the National Association of Hispanic Journalists is to be held Aug. 3-7, 2016, at the Marriott Wardman Park Hotel in Washington, where NABJ was founded in 1975. Not using the Washington convention center will save $150,000, Butler said. Plans to host a presidential debate at that election-year convention have been scrapped, as the application to hold the event would cost $8,000, in addition to $20,000 in other fees. NABJ is seeking a grant to undertake a strategic plan to guide it for the next few years, Butler said. Also at the Friday business meeting, Duchesne Drew, president of the Minnesota chapter of NABJ, a former business editor of the Star Tribune in Minneapolis and community network vice president of the Bush Foundation, a Twin Cities area organization, scolded the NABJ board for failing to take advantage of the presence of 19 Fortune 500 companies in the area, a reason he said his NABJ chapter had urged the national group to meet in the area in the first place. Djibril Diallo, senior adviser to the executive director of the Joint United Nations Programme on HIV/AIDS and longtime NABJ member, called NABJ the largest organization of journalists in the world and urged the association to seek financial support in Africa, the Caribbean, Latin America and elsewhere in the world. Despite the troubling nature of the organization's finances, the convention proceeded on an upbeat note with a rich selection of workshops and panel discussions, an invitation from Prince to visit his Paisley Park recording studio complex on Saturday night and praise for Executive Director Darryl R. Matthews, who assumed the job last year. For the first time in recent years, members who had been critical of the board, particularly on financial matters and on the previous executive director, introduced no motions from the floor nor called the board to task. Butler was pleased. "I don't think we need the drama," he told the group as the session ended.
. . . Glover Says "Setbacks Just Set You Up for a Comeback"
One of the first questions Sarah J. Glover was asked Friday after winning election as president of the National Association of Black Journalists was how victory felt after coming so close to it two years ago, when she lost by 22 votes to Bob Butler. Glover, 41, reflected on her life story. She was an adopted child, she said. In 2008, she was one of six members of the photo staff of the Philadelphia Inquirer who were laid off. In 2012, she took a buyout from the Philadelphia Daily News after being told that she would receive a better deal than if she were laid off. Glover reinvented herself as social media editor at NBC-owned WCAU-TV in Philadelphia. Last October, she was promoted to social media editor for the national digital team at NBC Owned Television Stations. "I look at these as learning opportunities," Glover told her press-room questioner regarding her setbacks. "I'm really good at just shaking things off" and moving on. As a black journalist, people tell us "what we can't do," she said. "Setbacks just set you up for a comeback." Glover told Journal-isms afterward that during the campaign, "people related to my professional ups and downs. People are struggling," she said. "People are underemployed." Starting last spring, with more intensity last summer, Glover said, NABJ activists began to urge Glover to run again for NABJ president. Glover had attended her first NABJ convention in 1993 and considered herself an "NABJ baby." She had been a three-term NABJ board member and president of the Philadelphia Association of Black Journalists from 2009 to 2012. "People were well-informed," she said of the NABJ electorate. "They said, 'I Googled you. I checked you out. You're the one with all the experience.' They got a sense of why I was running, and were able to see that I was a dedicated member." In the interview, Glover returned to the theme she outlined at the news conference. "The moral of the story is you shouldn't let things hold you back. [The setbacks] remind me to keep going forward." Glover said she thought of one of her inspirations, veteran Philadelphia Inquirer journalist Acel Moore, an NABJ founder, with whom she spoke by telephone before appearing at the victory news conference. Moore was called "boy" in the Inquirer newsroom when he started there as a copy clerk in 1962 — whites with the same job were called by their names — and rose to become an associate editor and columnist, "making a difference in the Philadelphia area." Glover said throughout the campaign that NABJ finances would be her top priority, and she reiterated at the news conference, "We have to be able to be agile and flexible, and able to say no and show restraint." She also said she wants to put her social media skills to use in marketing NABJ programs, such as its Media Institute. She said that will be especially useful in reaching students who, according to June figures announced Friday, are 35 percent of the NABJ membership. "You've got to reach people where you are," she said. Likewise, she said she believes that she can demonstrate to resource-rich Silicon Valley companies that NABJ can be a resource for them as well as a financial partner. Ellison: Cover Laws Allowing Police to "Take People's Stuff"
Recent on-camera revelations of misbehavior by police toward people of color have created an atmosphere favorable for legislation to curb excesses by the criminal justice system, Rep. Keith Ellison, D-Minn., said Thursday at the National Association of Black Journalists' Minneapolis convention. They are among issues that Ellison said black journalists should take the lead in bringing to public attention. "Put a microphone in people's faces and get the real story from people on the ground," he said. "You all can assure democracy when the political process is all gummed up." Speaking on a plenary session panel, "Race in America: How Far Have We Come?," the Minneapolis congressman called for legislation revising requirements for mandatory minimum sentences involving nonviolent crimes, and reducing civil asset forfeitures, in which he said police are allowed to "take people's stuff" in order to fund police departments. "A bipartisan coalition in Congress including Sen. Rand Paul (R-KY) and Sen. Angus King (I-ME) is seeking to stem widespread abuse of federal civil asset forfeiture laws. "Under current law, law enforcement and government agencies can seize private property — including cash, cars and houses — merely on the 'suspicion' that it was involved in the commission of a crime, without any criminal charge or conviction required. "Earlier this month, Attorney General Eric Holder announced new rules that prohibit federal agencies from 'adopting' assets not related to public safety that are seized under federal civil asset forfeiture laws. "Paul spoke about legislation he is sponsoring in Congress called the Fifth Amendment Integrity Restoration (FAIR) Act, which would require the federal government to 'establish, by clear and convincing evidence, that there was a substantial connection between the property and the offense.' "
He also said, "The government would also be required to hold a hearing to demonstrate probable cause within 14 days of forfeiture, rather than holding property indefinitely as is the case now. "Paul was joined at the press conference by other House sponsors of the bill, including Rep. Tim Walberg (R-MI), Rep. Scott Garrett (R-NJ), Rep. Tony Cardenas (D-CA), and Rep. Keith Ellison (D-MN). . . ."
In an editorial for Saturday's editions, the Detroit News noted, "Michigan's efforts to control law enforcement's civil asset forfeiture is garnering nationwide attention. The House has approved a package of bills aimed at setting stricter rules for police when they seize property believed involved in criminal activity, even if charges never are filed. . . ."
The editorial also said, "The bills are a good start and should be approved by the Senate, but they don't go far enough to protect citizens. If civil forfeiture is allowed to continue, the guiding principle should be that no property is taken without a criminal conviction, which also is the coalition's goal." Ellison, co-chair of the Congressional Progressive Caucus, also said, "You can't call yourself progressive without putting racial policies at the center." BuzzFeed, a social news and entertainment company honored for its diversity last year by the National Association of Hispanic Journalists, on Thursday received the "Best Practices" award from the National Association of Black Journalists. "The company's hiring practices have placed diversity at the forefront," NABJ President Bob Butler said in a news release. "NABJ applauds BuzzFeed for their effective and diverse hiring practices." The release also said, "Along with in-depth Latino coverage BuzzFeed also excels at gender equity: The company employs 51.6 percent men overall, however 52.2 percent women are in editorial positions.
" 'While BuzzFeed has not yet reached its goal of having a staff with diversity that reflects its readership, they are to be commended for publicly valuing the importance of this goal, and for leading the way among digital outlets in taking seriously the need to expand the pipeline necessary to create such a newsroom,' said Errin Haines Whack, Vice President-Print. 'Their leadership has been a catalyst in diversity hiring in digital media, and NABJ is excited to celebrate and encourage that.' . . ."
In September, BuzzFeed hired three black journalists: entertainment writer Kelley L. Carter, foreign news editor Hayes Brown and political writer Darren Sands. Editor-in-chief Ben Smith told Journal-isms by email then, "I hesitate to comment on them as a trio — I don't think anybody would ask me for comment if we'd hired three white people for those jobs! — but diversity is something we care deeply about in hiring in order to serve our wildly diverse audience." Last October, In an effort to expand opportunities for journalists of color and other diverse backgrounds, BuzzFeed News and the Columbia University Graduate School of Journalism announced a year-long investigative reporting fellowship. NAHJ honored BuzzFeed with a media award at its convention in San Antonio last year for "truly humanizing stories about Latinos fighting, protesting, fasting for immigration reform." Adrian Carrasquillo, accepting for BuzzFeed, said the website had grown from having two people with an interest in Latino coverage when he started last June to having a dozen. Julian Castro, secretary of the U.S. Department of Housing and Urban Development, who appeared in June at the Native American Journalists convention and last year at the National Association of Hispanic Journalists convention, delivered remarks at a luncheon tribute Thursday to legendary photojournalist Gordon Parks. Castro empathized with journalists of color who are "the only one in the room" in their newsroom or have difficulty having their ideas accepted. "Ground yourself with people who love you who believe in you even more than you believe in yourself," he urged. At a Friday luncheon panel, "Covering Race in Post-Racial America," Keith Woods, NPR vice president for diversity in news and operations, praised a two-part series on public radio's "This American Life" as must listening for those interested in in-depth reporting on race. Nikole Hannah-Jones of the New York Times Magazine, a fellow panelist who is NABJ's Journalist of the Year, reported on the school district attended by Ferguson, Mo., shooting victim Michael Brown. Alan Page, defensive tackle with the Minnesota Vikings who became a Minnesota Supreme Court Justice; Tony Oliva, "one of the most dangerous hitters in Minnesota Twins history"; and Briana Scurry, "an impregnable goalkeeper who helped her team win a World Cup and two Olympic golds," were among six celebrated sports figures honored Friday by the NABJ Sports Task Force with Sam Lacy Pioneer Awards. They were joined by two former University of Minnesota stars, boxer-football player Bill McMoore and basketball player Linda Roberts, along with Minneapolis Star Tribune sports reporter LaVelle Neal, the task force announced. At a current convention news conference, Prudential Financial Inc. discussed a new Prudential study finding that "African Americans demonstrate continued optimism about their current financial situation and growing affluence. Yet gaps in long-term retirement planning, including not taking advantage of financial and investment tools, may hinder the ability to build long-term wealth. . . ."